Direct greater resources to community based organizations and non-profits that can assist in community development and economic growth. The success of the AALC is dependant largely on the participation and activism of its members and HRC highly encourages members of the community to participate in the AALC and/or any of its working sub-groups. 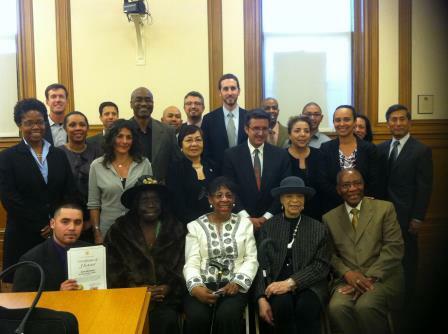 Process: On August 28, 2014, the Commission issued a public call for nominations for individuals, organizations and students to engage the city on the collective importance of recent civil rights victories and achievements in San Francisco. The Commission honored 14 individuals and organizations. Process: On May 28, 2014, the San Francisco Human Rights Commission issued a statement celebrating the life and work of Dr. Maya Angelou. Process: The San Francisco Human Rights Commission and the Lawyers’ Committee for Civil Rights invited legal experts, academics and community members to discuss the continuing legacy of Brown v. Board of Education and the successes and challenges of achieving racial equity in the San Francisco schools. The decision will be examined through a legal, historical and cultural lens. Purpose: Provide support to community organizations to enhance their capacity to identify and address education-related legal issues and to address the over representation of students of color in special education. Process: Beginning in 2013, HRC, in collaboration with the Lawyers Committee for Civil Rights, Mo Magic, Coleman Advocates for Children and Youth and the San Francisco Public Defenders Office, commenced providing free, legal education clinics in the Bayview and Fillmore Districts aimed at educating parents, students and direct service providers on how to leverage the law to identify and create community based solutions in schools. The clinics address school discipline, special education services, discrimination and advocacy. Purpose:The Book Club has 4 main goals: 1) Awareness - Youth will obtain an awareness of the book’s content as well as self-awareness about their place within the mass incarceration cycle. 2) Empowerment - Through participating in interactive study sessions, youth will challenged to find agency and ownership of their decisions. 3)Education – Youth will gain knowledge on history and public policy. 4) Skill building – Through reading, writing and public speaking students will learn to be community facilitators. Purpose: The Mayoral Stakeholder Community Forums were created to help advance the inclusion and engagement of diverse, disconnected, and disproportionately impacted San Franciscans in the public discourse, economic opportunities and vibrant social life of the city. Process: Each forum will highlight the best and most innovative ventures, policies, and programs that advance diversity in the San Francisco Bay Area. The forums are free and open to the public. Purpose: To address the disproportionate impact that the overbroad usage of criminal background checks has on communities of color. Process: Since 2010, the HRC has been working with community organizations, city partners, employers and housing providers to facilitate a local conversation on reentry and human rights. On April 14, 2011, the Commission voted unanimously to send a letter to the Board of Supervisors and the Mayor urging them to pass legislation to address the lifelong collateral consequences experienced by persons with arrest and conviction records in accessing housing and employment. Following this historic vote, the HRC conducted a public awareness campaign and “Best Practices” trainings. The Fair Chance Ordinance was signed into law on March 4, 2014. The HRC will continue with its public education and outreach campaign by conducting trainings on the ordinance with stakeholders. In addition, the HRC hosts a monthly reading group for youth on The New Jim Crow by Michelle Alexander. Purpose: To strengthen alliances, build organizational and institutional skills and commitment, share promising practices and develop and implement policies that promote racial equity. Process: Beginning in 2013, HRC has partnered with the Seattle Office of Civil Rights and the Portland Office of Equity and Human Rights on the Governing For Racial Equity Network. On March 25-26, 2014 the GRE held its third annual conference. It attracted nearly 450 participants from the Pacific Northwest as well as jurisdictions in New York, Minnesota, Massachusetts, Iowa, Wisconsin, California, and Virginia. Workshops and presentations focused on the history of racism and on incorporating a racial equity lens for training, policy development, health, transportation, planning and other governmental functions. Purpose: To provide summer internship prep for students from low income and communities of color during the San Francisco Unified School District’s Spring Break. Process: Throughout the week, students participated in workshops on identifying summer internship opportunities, interviewing, making a good first impression, and how to get promoted. Process: The HRC and the Equity Advisory Committee put out a public call for nominations for individuals, organizations and students to engage the city on the collective importance of recent civil rights victories and achievements in San Francisco. The finalists were selected based on their commitment to equity and their courageous contributions in the field of civil rights and economic justice. Purpose: To honor civil rights activist and transgender leader, Jazzie Collins. Purpose: To celebrate African American contributions to literature and inspire a love for reading among San Francisco’s youth. Process: HRC Commissioners and staff read aloud a book by a black author and/or illustrator in elementary school classrooms across San Francisco. Purpose: In response to African American out-migration from San Francisco, the EAC put on an African American literary series at the Bayview Public Library. Process: Over four weeks, EAC members read stories, shared experiences and engaged parents on history, community and the importance of education. Purpose: To discuss and document key issues and obstacles that lesbian, gay, bisexual, and transgender elders of color face each day. Process: Entitled “Setting the Agenda: Issues Facing LGBTQ Elders of Color,” the goal of the event was to provide a forum for LGBTQ elders of color to talk about their experiences and issues in advance of the appointment of 15 members to the newly formed San Francisco LGBT Elder Task Force. HRC also dedicated its annual PRIDE theme to honoring the contributions of African American LGBT Activist, Bayard Rustin. Purpose: To advise the Commission on individual rights impacted by the War on Drugs and make recommendations to increase public safety and reinstitute those rights. Process: HRC welcomed over 100 community members to the Board of Supervisors Chambers for a hearing entitled the “Human Rights Impact of the War on Drugs.” The Commission will issue a hearing report which will include recommendations to the City of San Francisco for reducing the harm of the War on Drugs. Purpose: To specifically address, prevent and remediate the negative impact of the out-migration of the African American community in San Francisco and finally implement the findings and recommendations of numerous reports, spanning more than two decades, which examine the parity of the African American community in San Francisco. Process: HRC staff conducted over 30 meetings with local stakeholders to learn more about the impact any proposed legislation would have on them and to obtain their ideas about how to best address the need to reduce barriers to persons with arrest and conviction records. Process: In response to the disproportionate representation of African American and Latinos in the criminal justice system and the subsequent concentration of the social and economic disadvantages of discrimination in communities of color, the Human Rights Commission unanimously endorsed a letter to the Mayor and Board of Supervisors requesting that legislation be passed.